[Ottawa – June 24, 2017] The voter landscape doesn’t mean much as we are still two years away from an election; but it does reveal some interesting new features. 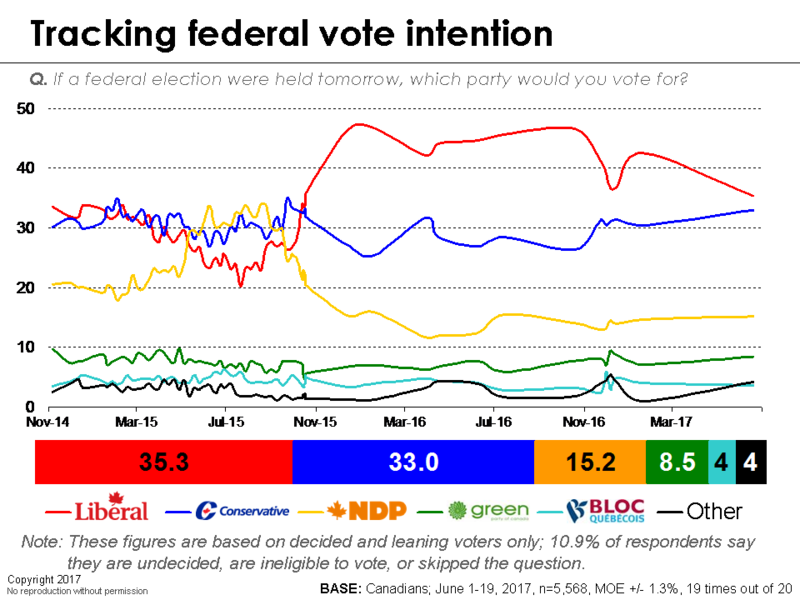 Most notably, we see a tightened race with the Conservatives enjoying a post-leadership bounce from the election of Andrew Scheer. The Liberals maintain a slight – but statistically significant – lead of 2.3 points, but this is greatly diminished from the large lead that they enjoyed a year ago. The NDP and Green Party remain stuck at around 15 points and nine points, respectively, with neither party showing any indication of moving one way or the other. 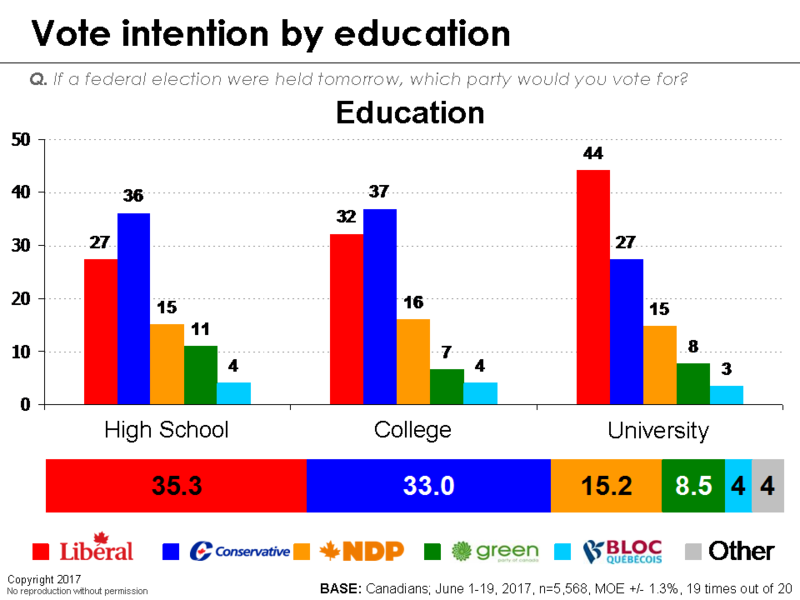 What is perhaps most notable about the demographic patterns underlying these numbers is the sharp re-occurrence of the education division that defined the Harper era. At the outset of his mandate, Justin Trudeau enjoyed near uniform support across the educational spectrum. Two years later, however, his support is becoming increasingly confined to those with a University degree. Those with a high school or college education seem to be returning to the ranks of the Conservative Party. These shifts can be connected to a uniquely Canadian expression of populism which is reshaping our political landscape. Also worth discussing is the large gender gap between the Liberals and the Conservatives. If voting were limited to women, the Liberals would easily win another majority. If it were limited to men, we would be looking at a Conservative government, likely a majority. The Liberals also enjoy a comfortable lead with new Canadians, while the Liberals and Conservatives are locked in a fierce competition for the middle-class vote. Regionally, the Conservatives dominate Alberta and Saskatchewan, while the Liberals lead everywhere east of Manitoba. British Columbia is very much a four-way race, with all four federalist parties enjoying a competitive position. Turning to outlook on the direction of the federal government, there is mixed news. Generally, Canadians hold a positive outlook on the direction in which their country is headed, particularly compared to the last ten years. National direction is seen much more positively by Liberal supporters, but receives reasonably good marks outside of the Conservative supporters, who are much less comfortable with the direction of the country. New Canadians are particularly impressed with national direction and women are also more favourably disposed. We also see a very large and important gap across educational attainment and social class. Those who have a university education and members the middle and upper classes are far more comfortable with national direction than those who identify as working class and poor. This structural divide across the more comfortable and more vulnerable classes is a critical feature of the new outlook. It reflects growing resentment to the professional elites from the working class who are feeling left behind in the new economic order. This in turn has fuelled the rise of populist sentiments in Canada. 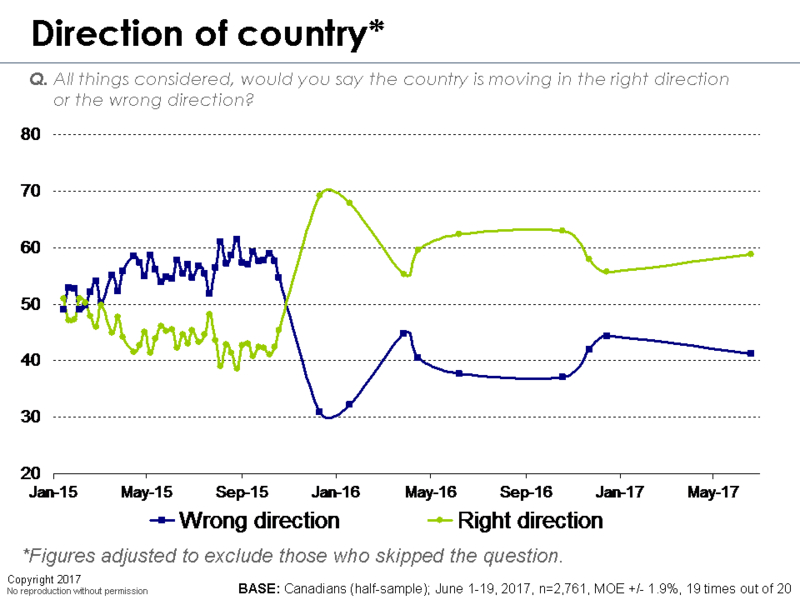 Looking at the question of whether the federal government is moving in the right or wrong direction, Canadians are much more divided. 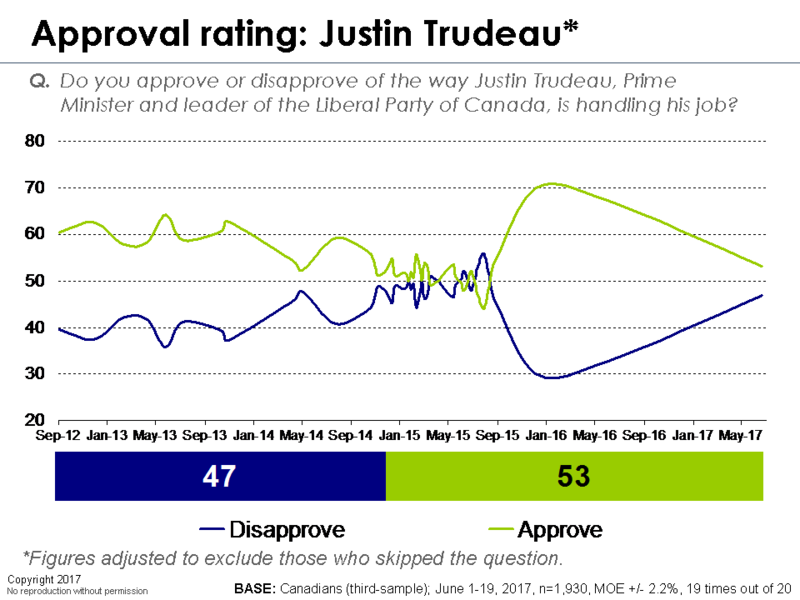 There has been a clear decline in satisfaction with direction of the federal government and any vestiges of the honeymoon that Mr. Trudeau enjoyed after ousting Stephen Harper are no longer evident. Instead, views of the federal government have become sharply divided along partisan lines. Liberal supporters look upon their government with near universal approval, while the vast majority of Conservatives are unhappy. Once again, new Canadians and women are more favourably disposed. It is also the case that those who are attracted to the allure of populism almost universally agree that the county and federal government are moving in the wrong direction. All in all, the national mood is heavily divided among partisan and, to a lesser extent, regional lines. We have effectively divided ourselves into two Canadas: those relatively comfortable with national and federal direction (i.e., ‘progressive’ Canada) and conservative Canada, who are decidedly unhappy with where we are headed. What is critical to understand is that conservative Canada is sharply different from the traditional conservative Canada we recall. Notably, it is no longer clearly older or confident about its place in the economic order. This new constituency is the most interesting and important force to watch in the new political landscape. Finally, no analysis of the federal political scene would be complete without a look at the party leaders’ approval ratings. Note that for this survey, we opted to leave out Thomas Mulcair, as he will be replaced in four months’ time and we did not feel that the results would be particularly meaningful. First up is Justin Trudeau who continues to enjoy a net-positive approval rating, one of the few political leaders in Canada to boast such a feat, although his popularity has dropped considerably in the last year. The forces behind this decline are difficult to assess, but he no longer enjoys the level of support among young people that he once did. Elsewhere, the demographic and regional patterns largely reflect vote intention; Mr. Trudeau does well with women, university educated, and new Canadians, while he is not particularly well liked in Alberta or Saskatchewan. 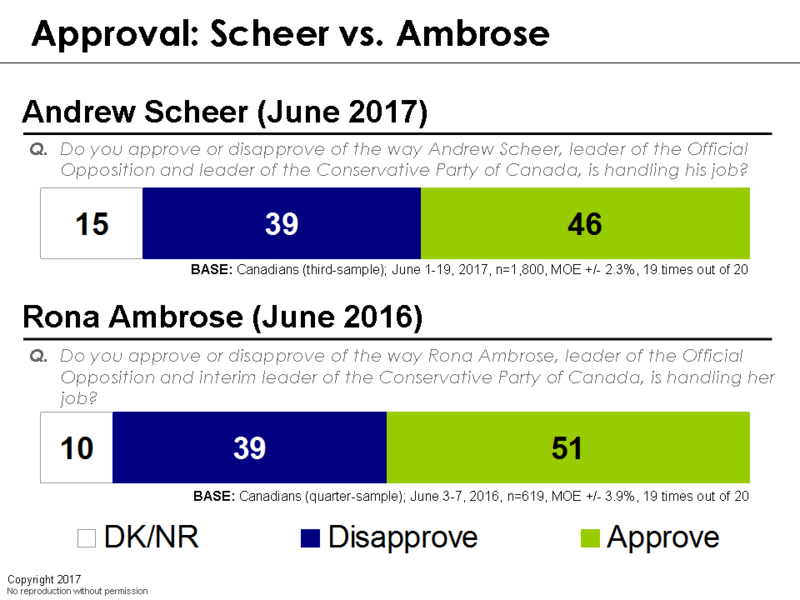 Next up is Andrew Scheer, whose approval ratings are also quite good and certainly better than what we were seeing from Stephen Harper. However, it is notable that he actually fares slightly worse than Rona Ambrose. 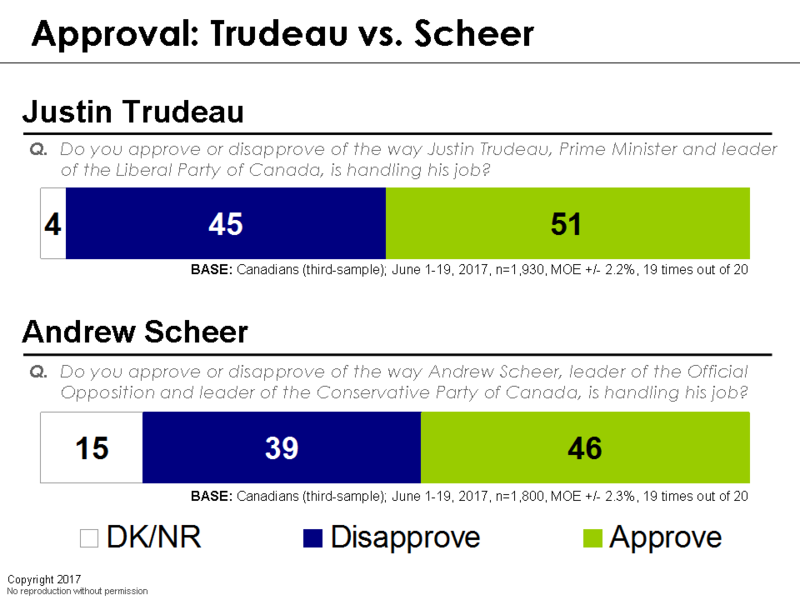 The demographics patterns underlying Mr. Scheer’s approval ratings could not be more different than those of Mr. Trudeau. He is very popular in Alberta and Saskatchewan and he does very well with men and older Canadians. He also does surprisingly well with younger Canada (at least for the leader of a party that, historically, has never fared particularly well with young people), which is perhaps a reflection of his relatively youthful age. The rise of ‘Northern’ populism? One of the more interesting features of not just Canada’s political landscape, but the political landscapes and societal outlooks of the advance Western economies, is the rise of what is called populism. Others have referred to this movement under the rubric of nativism, authoritarianism, ordered outlook, or perhaps even isolationism. It was a powerful force that was expressed in the election of President Trump in the United States and the British decision to leave the European Union. So one of the questions that we addressed (in a preliminary and relatively crude probe of this issue that we will refine over time) was whether or not populism is a force in Canada. The answer appears to be – somewhat surprisingly – yes. And the continued denial and dismissal of this new force among the more comfortable and educated portions of society is both empirically wrong and a force fuelling the very phenomenon they seem to despise. We presented respondents with a simple and pretty arbitrary definition of populism as a rejection of elite authority and as a wariness of immigration, trade, and globalisation. 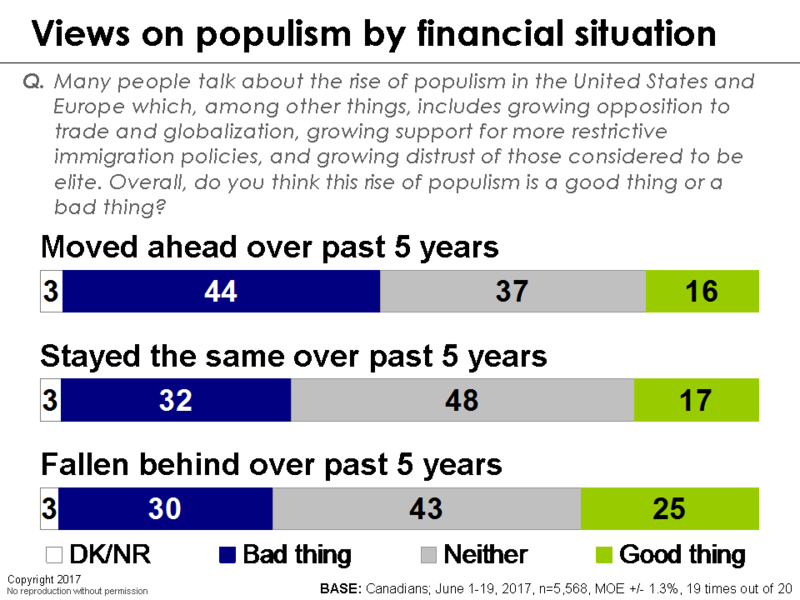 We also asked Canadians whether they thought this new populism was a good or bad thing. Strikingly, only 33 per cent of Canadians say that it is a bad thing. While the most common response was one of ambivalence, uncertainty, or conditional ‘wait-and-see’, it is striking that two-thirds of Canadians either think it’s a good thing or aren’t sure. The fault lines in whether populism is seen as a good or bad thing are quite revealing as well. Populist supporters are much more likely to feel they have fallen behind and that their economic future will be even worse. The economics of despair may be the initiating factor for this new movement, but its expressions now link to a more closed and ‘ordered’ outlook on the world. It also appears that populism is now viewed much more favourably within the Conservative camp, where economic outlook – both looking backward and forward – has changed dramatically in the last few years. Under Mr. Harper, Conservatives were relatively optimistic and felt that they were moving ahead; now, they appear to have morphed into a far more economically pessimistic constituency with near universal disdain for direction of country and its government. It is this economic malaise that is one of the critical ingredients of populism. Despite these tendencies, there is surprisingly receptivity to populism in the other, more comfortable portions of Canadian society as well. It is also the case that those attracted to populism are more likely to be male, and it also finds greater favour in Alberta. 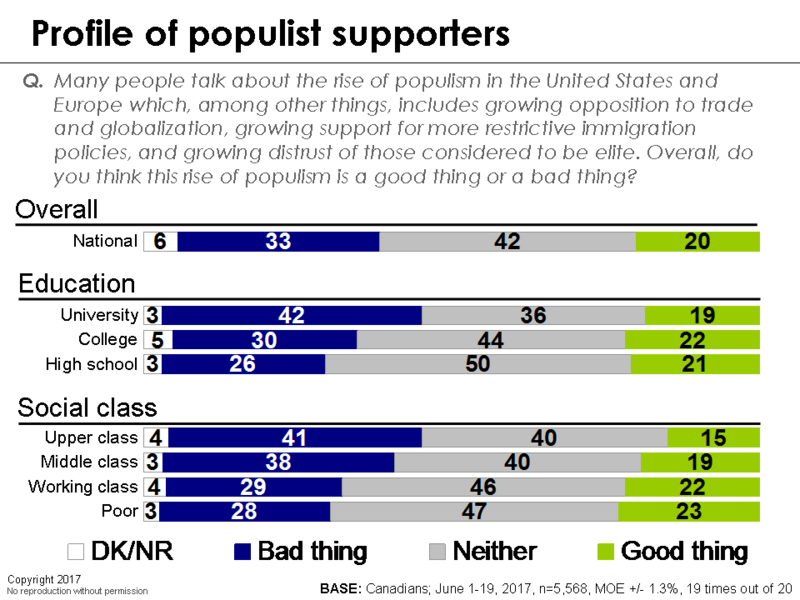 Quite strikingly, positive attitudes to populism are stronger among new Canadians and, by corollary, weaker among traditional, ‘born in Canada’ citizens. If Trump populism is rooted in the white working class, that explicitly does not appear to be the case in Canada. Nevertheless, this brand of populism is still relatively new in Canada and it does appear that our ‘Northern’ version of populism is quite distinct from the versions that we have seen in United States or in the United Kingdom. Northern populism does not include the same allergy to globalization and trade. 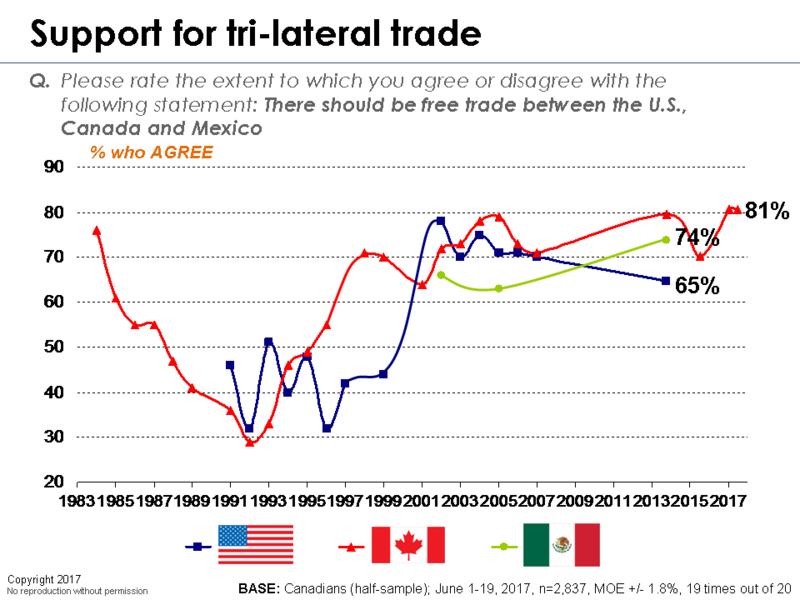 In fact, at 81 per cent, support for NAFTA remains very high. Notably, support for trade liberalisation is considerably lower among those attracted to populism. It is unclear how ‘Northern’ populism is related to issues such as race and immigration, but populist supporters are more likely to think favourably of Trump (even though the majority do not approve of him) and they are also much more likely to favour smaller governments. These themes will be developed in our next release. Lastly, we asked Canadians whether they believe that populism is a growing force within Canada. 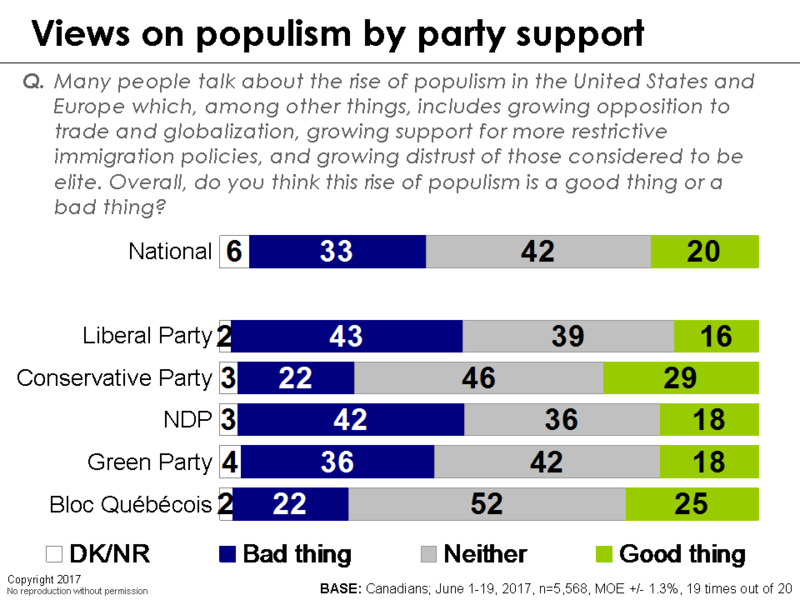 For the populism deniers out there (this is just so not Canada), please note that only one in five Canadians agree that populism is not a growing force in Canada. So, overall, we see quite a different political landscape where continued economic stagnation and decline are fuelling a uniquely Canadian expression of populism that is less ‘white’ and less closed than the expressions in Europe and the United States. It is more rooted in a new class conflict across the diminished middle class and the burgeoning working class. Nietzsche noted that resentment was the fuel of modern civilisation. This may have been a prescient insight into the 21st century. The field dates for this survey are June 1-19, 2017. In total, a random sample of 5,658 Canadian adults aged 18 and over responded to the survey. The margin of error associated with the total sample is +/- 1.3 percentage points, 19 times out of 20.